Alexander Steen is the Blues' leading scorer with 24 goals and 38 points in 35 games. 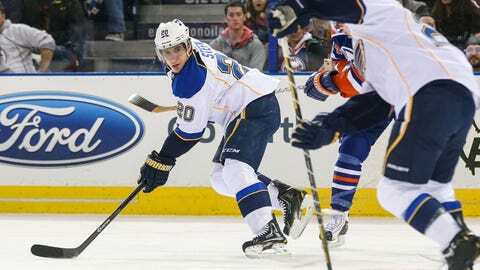 ST. LOUIS — The St. Louis Blues have placed star forward Alex Steen on the injured list with a concussion. General manager Doug Armstrong says the league’s No. 2 goal scorer will be out indefinitely. He announced the move in a statement Saturday before the team’s game that night with Chicago. Steen hasn’t played since he left a game against Edmonton on Dec. 21 with what the team called an "upper body injury." Steen is the Blues’ leading scorer with 24 goals and 38 points in 35 games. He has six game-winning goals, second most in the league. The Swede is in his ninth season. He signed a three-year $17.4 million contract extension with the Blues this month.